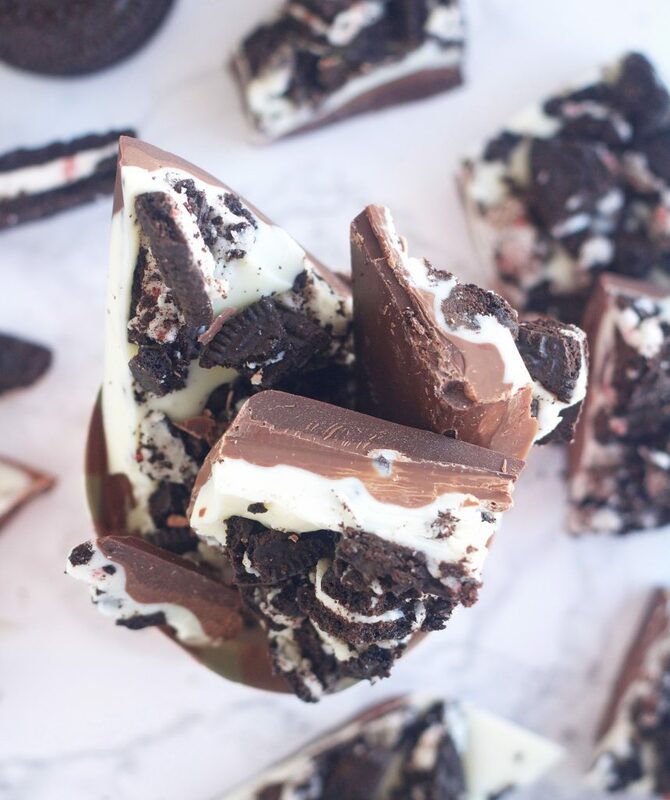 Dark chocolate, milk chocolate, white chocolate and peppermint bark Oreos all layered together make this amazing Triple Chocolate Peppermint Oreo Bark. It’s screams holidays and is a simple, delicious neighbor gift. On the 5th day of this 12 Days of Sugar I’m sharing this amazing Triple Chocolate Peppermint Oreo Bark. Oh this stuff is naughty, really, really naughty. 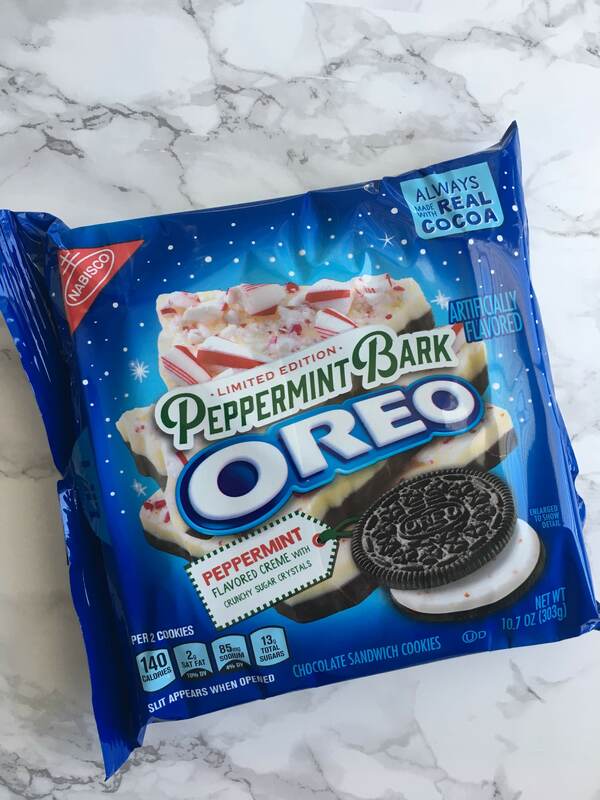 I snagged a package of these Peppermint Bark Oreos several weeks ago when I saw them at the grocery store. One bite and I was hooked. We’re currently on our third package and I already know I’d better go buy more before they’re gone. I think they’re my favorite holiday Oreo ever! 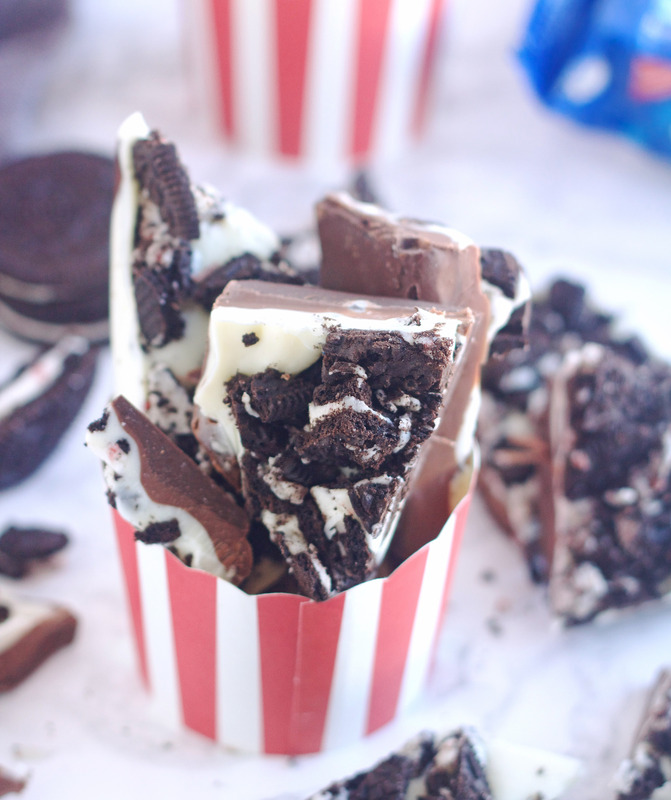 I knew I wanted to make something using them so here you have it, this triple chocolate bark loaded with Peppermint Bark Oreos and it’s stupidly delicious! I love making barks because the options are endless and they are so simple to make. This is a great neighbor or teacher gift to give. It would look darling wrapped up in a cellophane back with a ribbon tied around it or in a cute gift box. Anyway you wrap it up, your friends are going to love it. Make sure you stir your chocolate really well after each cooking increment in the microwave. Don’t overheat your chocolate or it will seize up. I like to cook it at full power for the first minute of cooking, and then I adjust the power to 50% for the remaining 30-second increments until it’s melted and smooth. Don’t let each layer get too cold when you put it in the fridge to set up, if it does, this could cause each layer to separate. Put it in the fridge just until it’s almost set. This is a pretty thick bark, so it’s easier to cut using a sharp knife rather than trying to break it into pieces using your hands. It also cuts easier if it’s at room temperature. If you don’t want this quite as thick, you can cut back the amount of chocolate you use in each layer. Maybe use 5 or 6 ounces of each chocolate. I have also used quality chocolate chips instead blocks of chocolate for the dark and milk chocolate and had great results. I do use a white chocolate bar or these Ghiradelli white chocolate melting wafers for the white chocolate layer. Bark is one of the easiest treats to make, which might be good and bad. 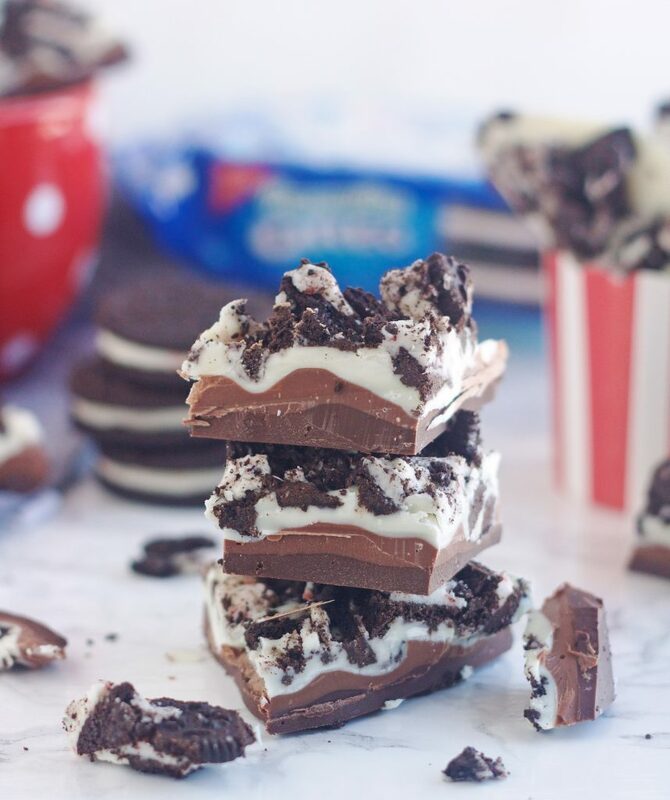 As if three layers of chocolate isn’t delicious on it’s own, adding the peppermint bark Oreos just makes this bark even that much better. Line an 8×8-inch square baking pan parchment paper. In a medium-sized, microwave safe bowl, melt milk chocolate, heating in 30 second intervals in the microwave, stirring vigorously with a spoon or rubber spatula after each increment, until completely melted and smooth.Pour on top of dark chocolate later and spread evenly with an offset spatula. Place the baking pan in the refrigerator for 10-15 minutes or until almost completely set. In a medium-sized, microwave safe bowl, melt white chocolate, heating in 30 second intervals in the microwave, stirring vigorously with a spoon or rubber spatula after each increment, until completely melted and smooth. Pour on top of milk chocolate layer after it has set. Before refrigerating, sprinkle top with crushed peppermint bark Oreo cookies. Bring to room temperature to serve. Slice with a sharp knife or break into pieces to serve. Peppermint Bark Oreos are new this year, but I have seen them in almost every grocery store. They are absolutely delicious, probably my favorite holiday flavor Oreo by far. 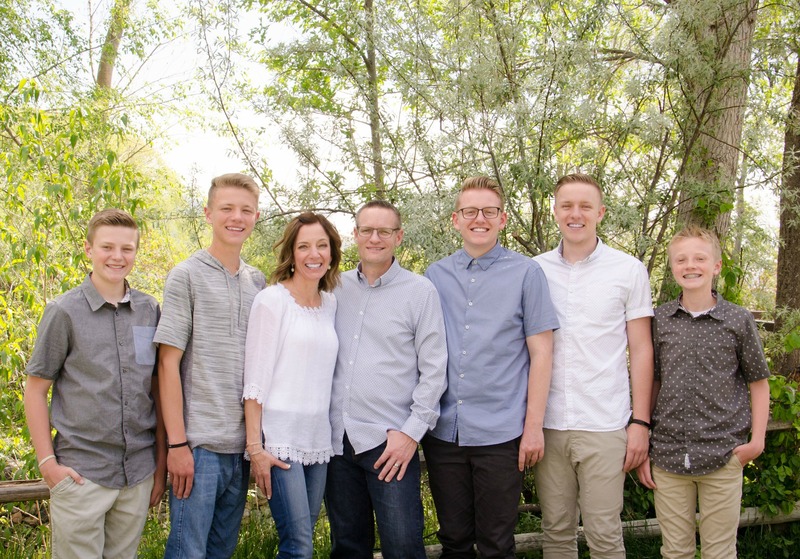 Hi Jodi, I got the day of sugar #5 in my email in box today. Earlier this morning, I unsubscribed from your blog. Then I resubscribed and it worked, I got it! Love it so much, never want to miss a post and it’s so easy to come to my inbox. Just wanted to tell you it’s working now so all set. Thank you!!! Hey Teresa, thank you for letting me know what you did. I had another reader email that was having the same problem so I will let her know what you did, and that it worked. Thank you so much for taking the time to leave comments, I so appreciate you! I wish we were neighbors then you could reap the benefits of my 12 Days of Sugar. LOL!! !